A GERMAN registered pelagic factory trawler is under investigation by officers from Marine Scotland after being detained west of Shetland on Monday afternoon. 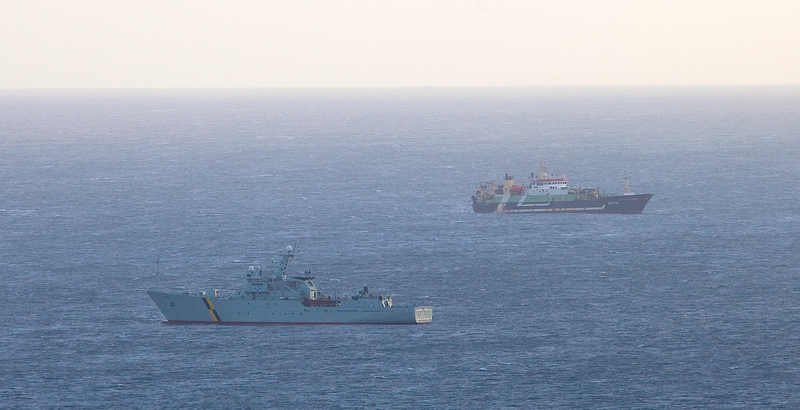 The 117 metre Helen Mary was detained by the fisheries protection vessel Jura and escorted from the fishing grounds west of Foula to just outside Lerwick harbour. Both vessels are currently waiting for the factory trawler to complete processing fish onboard before being allowed into the port. A spokesman for the Scottish Government said: “We can confirm Marine Scotland is escorting a vessel into Lerwick for suspected fishery offences. The Helen Mary is registered at the Baltic port of Rostock and owned by the Oderbank Hochseefischerei GmbH, which belongs to one of the world’s largest fisheries companies Parleviliet & Van der Plas.